These images come from an album compiled by an officer of the 1/5th Battalion Royal Scots who survived the war. He fought with this unit as part of the 29th Division in Gallipoli, the 1/5th being one of a number of Territorial units attached to what was a regular division. Against orders the officer had packed a camera into his kit and took a number of shots of life at both Cape Helles and ANZAC where the battalion fought, as well as during training in Egypt. It is hard to believe when looking at the photo above that this is an officer of the battalion; to say he is dressed casually is an understatement but it gives a good insight into how the heat and conditions at Gallipoli forced the British soldiers who fought there to have a complete rethink. Behind him is the dugout occupied by the officers of his company. 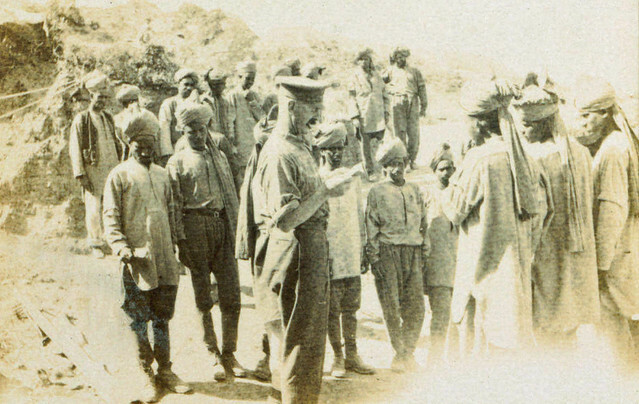 Below another officer of the battalion talks to Indian labourers attached to the unit to carry out labouring tasks close to the battlefield; this may have been anything from carrying up ammunition, food or water, to assisting in trench and dugout construction or repair. 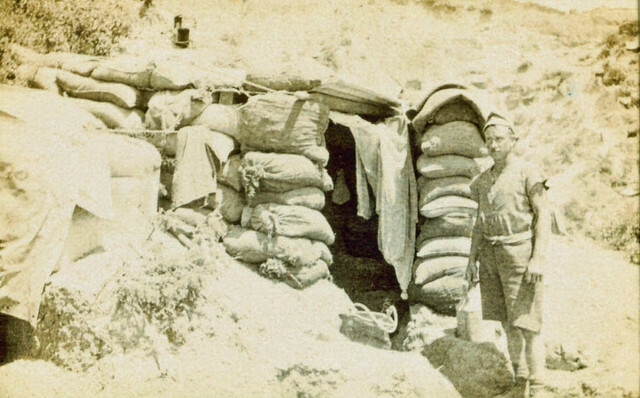 There were no official photographers at Gallipoli so we rely on illicit collections like these for our visual insights into the campaign; given the number of such albums known to exist, this officer of the Royal Scots was far from unique but his photos are perhaps the only pictorial record of the Royal Scots in the Gallipoli campaign. This entry was posted on 21/01/2012 by sommecourt. It was filed under British Army, Gallipoli, Great War, Indian Army, WW1 and was tagged with 1915, ANZAC, Gallipoli, Turkey. The image of the officer in the first photograph is not surprising. The military high command has traditionally been out of touch with uniforms and climate conditions. One would think they might learn valuable lessons from previous wars. Not so. My father served with the United States Navy during WWII in the Pacific on PT. Boats. They were assigned completely useless uniforms and shoes. The uniforms rotted in the jungle humidity and the boots filled with a gallon of sweat that had to be emptied. The men soon developed their own mish-mash of uniforms, begged, borrowed or stolen from various sources. The idiotic response of the high command? When my father was shipped out along with some of the other men, upon arriving at the base they were assembled for inspection. The commanding officer wanted to know, “Where the hell are your uniforms?” My father responded they rotted at the beginning of the war and no one sent them new replacements. The officer finally was convinced the men were telling him the truth. They were issued new uniforms, but they were incorrectly striped because the tailor couldn’t get them all done in time. Thanks for these photos. My great uncle, Pte William Cochrane, served with 1/5 RS at Gallipoli; earning a ‘wound stripe’ on 30 Jul 1915. He joined the army – under age – and was wounded days after his 18th birthday. He went on to serve in France as well. My Great Uncle Lynham Wilson served with 5th Batallion Argylle & Sutherland Highlanders from 17/8/1914. Unfortunately according to his papers he was missing then noted as killed in action on 12 July 1915 in the Dardanelles. Is there a war grave or any pictures? Haworth, West Yorkshire. 16th April, 2015.